Flavorful, warm and no fat! After my long spring bike ride today, I found myself craving noodles. Delicious, spicy warm Asian rice noodles with fragrant basil and lemon zest. I stopped at Star Market, a local ethnic food store with an amazing selection of Asian vegetables, curries and noodles. I wandered the aisles pondering the piles of fresh cucumbers, lettuces and root vegetables, passing up ethnic pastries and grocery sacks of baguettes for 1.79 (the entire bag, that is). 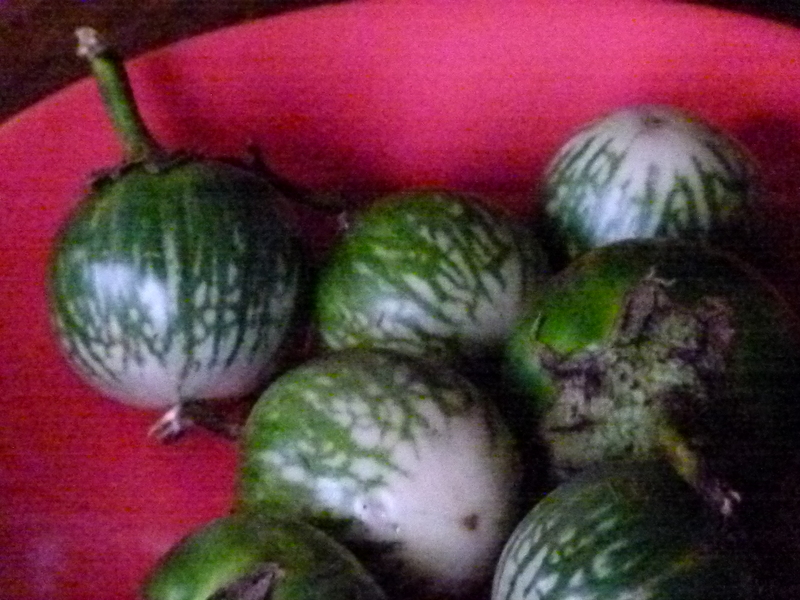 A nice choice of eggplant included the common purples, large and small, but also shiny green Thai eggplants with glowing golden stars on their faces. PERFECT! I have that nice bag of fresh radishes to roast at home, so I’m set! Pour a ½ cup of broth into your non-stick pan and simmer the radishes for 10 minutes (covered). Remove lid and let liquid boil off and allow radishes to brown just a bit. ¼ pkg rice stick noodles (4 oz.) I use Bun Gao brand Rice Sticks, but any thin asian noodle will do nicely! Simmer for 6-8 minutes. Correct seasoning. Fill your bowl with noodles and some broth. Arrange the eggplant and radishes on top. I love to cook up a giant pot of soup. As a no-fat vegan, I eat a TON of food, and I have to be sure there is always legal food in my frig to avoid a momentary lapse and grab those tortilla chips my husband keeps on his side of the pantry! Big-quantity cooking helps me stay on the straight and narrow. This is a soup inspired by color! I wanted warm, sweet ruby-orange yams and deep strong green kale to balance the foundation of plump snowy great northern beans. I threw in some green chili and mahogany kidney beans and garnished with orange zest. Beautiful. In a saucepan, cover white beans with water and boil for 2 minutes; cover with a lid and remove from heat. Let sit for 1 hour, then rinse. In large soup pot, add broth, white beans onion. Bring to boil and reduce heat and simmer, covered, for 1 hour. Add celery, garlic, chilies, and spices, simmer for 30 minutes. Correct seasoning for the broth to your taste. Add kale and yam, simmer for another 30 minutes. Just before serving, stir in zest. It is a snowy Seattle day in March and spring seems to be lost on its way to the Pacific Northwest. I’m yearning for the flavors of summer, but I’m savoring the fireplace and enjoying the winter white. Compromise! 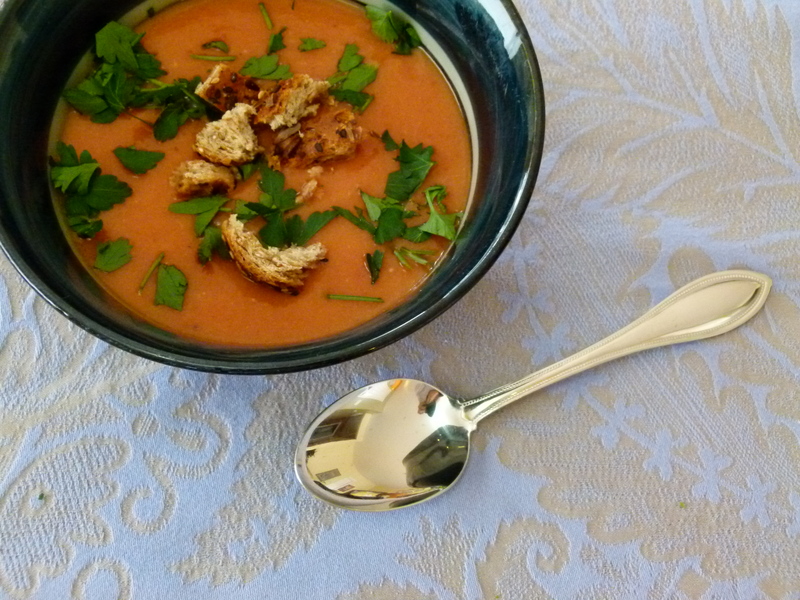 How about a warm bowl of creamy soup built on a favorite flavor of summer: tomatoes. Simmer with herbs and blend with sweet oven-roasted onions, garlic, and carrots. For croutons, cut up several slices of good non-oil based bread (Dave’s Goodseed is my favorite). Toss with 1 tsp. oregano or your favorite Italian spice mix and toast on foil at 325 oven, checking and turning until they are croutons. Serve soup warm with croutons and chopped parsley.